Perhaps that shouldn’t come as a surprise. Chuck Hughes’ restaurant has the sensibilities that match a city filled with young restaurateurs and artists passionate about perfecting their craft. It’s also a restaurant of the times. Prices are reasonable; plates are small, with three recommended for a table of two; ingredients are local; cocktails are inventive and a highlight of the experience; the professionalism of the staff is impeccable. Although Le Bremner clearly caters to the “it” crowd (designer jeans, low-cut dresses, fingers of bling), the host and wait staff were quick with a smile and helpful. In fact, when I initially walked into the 40-seat dining room near midnight last Friday, I was told there were no tables available. I left, only to be chased down on Rue Saint-Paul by the hostess. She had spotted another diner ordering the bill and figured it would be just a 10-minute wait before I could have that table. So, I followed her down the steps and beneath the awning marked with only the word “Restaurant” and into the dark, low-ceilinged space, impressed with her level of dedication and energy. I had a nibble of Hughes’ Perfect Little Steak ($18), cooked medium rare and served with a silky red-wine reduction, and a citrusy twist on a Sidecar ($12), fennel stick included. 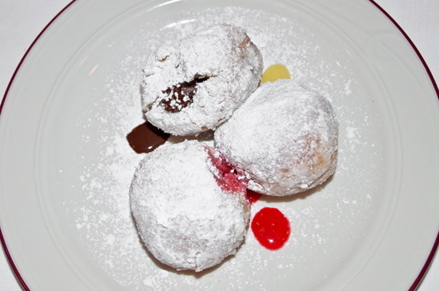 Then the Jelly Doughnuts ($8). They’ll remind some of the famed beignets at Café du Monde in New Orleans, but Hughes’ doughnuts are vastly superior, if only because the flavourful fillings are so scrumptious and the exterior so pleasantly spongy. Many restaurants strive for a signature dish — a blend of flavours that makes diners think fondly about their experience afterwards and tempts them to return often. In both his steak and his very Canadian dessert, Hughes has two contenders. DIRECTIONS: Le Bremner is at 361 Saint-Paul Street East, across from the Bonsecours Market. Reservations highly recommended. Tele: 514-544-0446. No website. ABOUT THE GREAT DESSERT SEARCH: A friend of mine came up with the name for The Great Dessert Search — a compilation of the absolute best sweet treats on the planet (or at least near Toronto). If you’ve got a dessert you’d like to nominate, let me know — or write about it yourself and send in photos if you have them. NOTE: All written and photographic material is copyright by this site.